I love customising, from being a 15 year old school girl who gemmed up her phone case to a twenty something year old fashionita enjoying adding a little personality to my everyday attire. It’s good to sparkle and shine, wasn’t it Monroe who taught us that Diamonds are a Girl’s Best friend! I’m no exception, and like the majority of females, we live life like magpies, chasing the sparkle. So why not brighten up every day. Converse, the typically standard footwear of choice for around 30% of the UK’s population today, so why not make them personal?.. This is how I glammed up my daily footwear! I started my mission with around 1000 Swarovski Crystal stones in hand, some fabric glue and a pair of tweezers (disclaimer: if you’ve not glammed anything up before, don’t start with that expensive pair of shoes you love! .. practice on some old plimsolls, it’s not quite as easy as you originally believe). 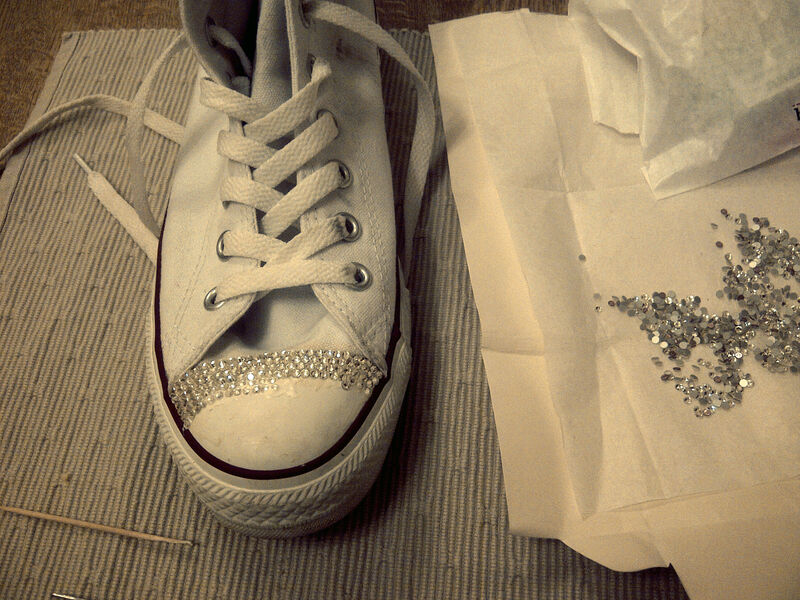 Working from left to right I began by gluing down my crystals to the shoes. Key tip: use a good glue, cheap glue isn’t particularly durable and crystals will begin to remove themselves when met with the standard British Winter Weather. If you’re thinking of doing this you can buy your Gem’s off online, but a word of caution, don’t order too many unless you’re sure the gems are of the right size and are authentic. 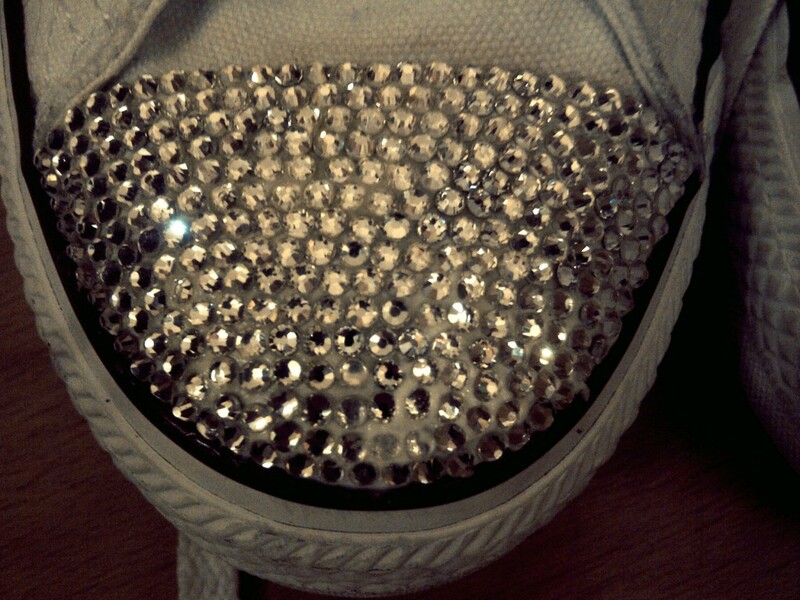 I only use Authentic Swarovski Crystals when customising my items, Swarovski sparkles to a much higher standard than an ordinary rhinestone, they cost a fraction more but are worth the price for the final outcome. It’s just a case of playing from this point, its advised that you lay out your line of crystals prior to sticking them down to ensure you have the space needed. Here’s the results of my latest personalisation! I’d love to know your thoughts. If you’re interested in purchasing some bespoke crystallised footwear message me at sales@rebekahesme.com for more information on prices and availability. I saw your message on IFB site and I found your blog through that. I love this idea. 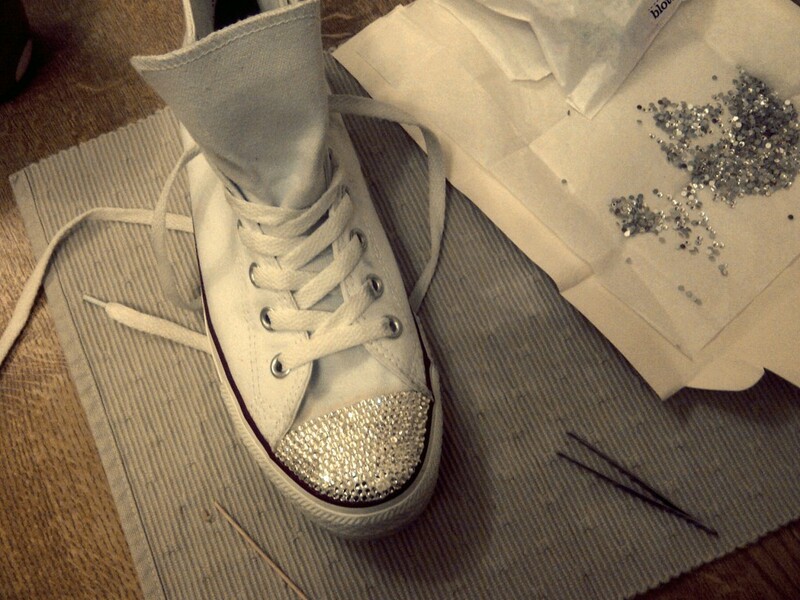 Those converses look perfect! Looks fabulous! 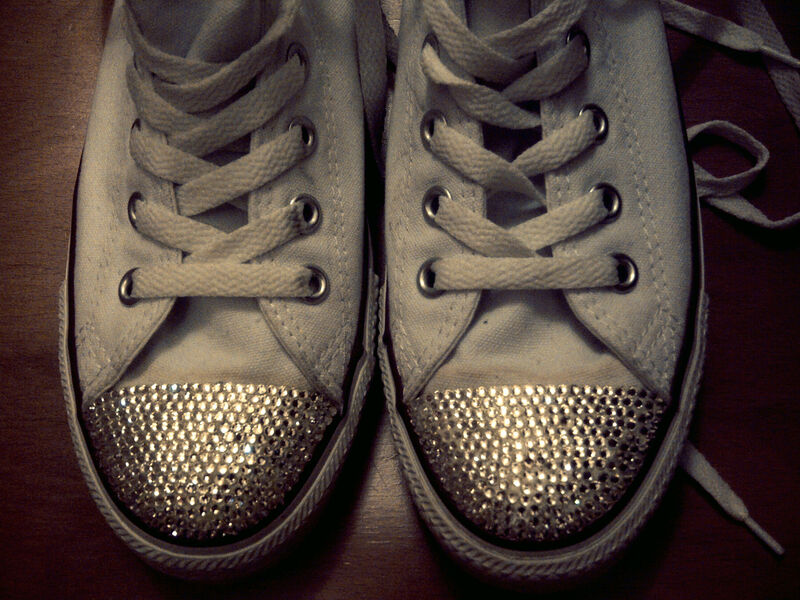 It reminds of the miu miu sneakers which I love. Will definitely try this DIY! Thankyou! Yes I love the miu miu’s! .. Make sure you share a picture of your results! Good Luck! woooow, really nice! explore more!